Stuart0742's last mystery location featured a 1930 dated stone and DaveH's a 1935 stone. There must be many buildings in or around Sheffield with stones like this, for example that funny little arcade between Leopold Street and Fargate that opened in 1987 has a fairly high and prominent dated stone saying, well, 1987. Can we find dated stones in the area for every year from the present back as far as goodness knows when?We don't particularly need pictures for this, just a list by year of the building name and location. For those people who like walking around old cemetries, monumental headstones and gravestones are not allowed,- that's cheating and makes it far too easy." there is a date of 1907 or 1908 on Cavendish buildings on West Street. many school board schools around the city have an 1872 and/or 1874 date. I didn't expect such a rapid response to this one and thanks to plaintalker we are already up to 10 dated buildings. Looks like I shall have to put together a constantly updating list if good suggestions like these keep coming in. I know you said no pics but this is an unusual one. In the 1980's the council cleared the derelict allotments at High Storrs. The work was done by a team of lads I think on a youth employment scheme. They cleared the scrub and rebuilt some of the perimeter wall. They were obviously proud of their work, as they signed an dated it! OK, I made a mistake about Cavendish buildings, it does have a date stone, but it's not 1907, it's 1910. I was wandering through town today heading up Division Street. 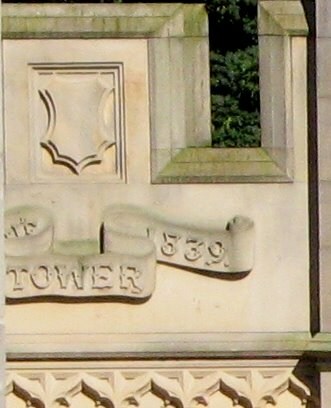 I noticed date stones on the Yates' Wine Lodge (1989) and on Centre 45, (the former bail hostel, and Probation services building) the date reading 1939. There is a house on Crabtree Bank on Crabtree that apparently has 3! Which I assume is the original and a couple of extensions! 1904, Formerly 'E Freidrich & Son' corner of Willey Street and Wicker. Oooh fantastic, my suggestion has been acted upon, to have a separate date stone thread! H&M fargate (not entirely legible) 1880? there's another dating stone above Lush but again its so interwoven it's not easily readable. Ruby Lounge, (was Dicken's Bar) Carver St inscription reads "National school Built By Subscription 1812"
Got to congratulate you here plain talker, that list is looking very good and is developing in the way that I suggested it could. Well done and thanks for taking this task on. 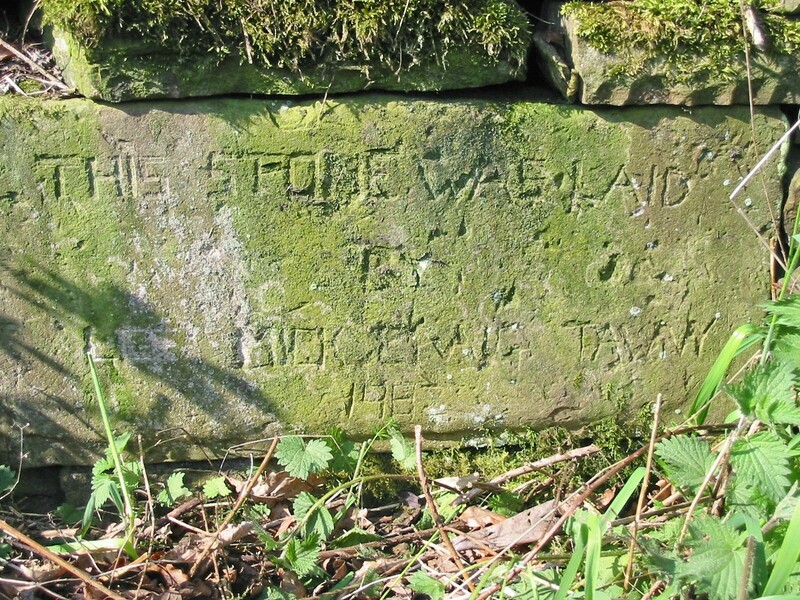 I also noticed a 17-something date stone (1784?) on a former Charity School on St James' Row, beside the Anglican Cathedral this afternoon. 1629 Hill Top Chapel, Attercliffe. 1690 Manor Farm Cottage Woodhouse. 1730 Fulwood Old School House. 1760 Cottages 46 - 52 Bradway Rd, nr Golf Driving Range (No 46 has the datestone of 1760). 1765 Building on Cherry Tree Road, recently sold under the name Wisteria Cottage. 1772 The Britannia Inn Attercliffe. 1786 Poor Girls School, St James Row. 1795 Sharrow Green Cottage, Psalter Lane by Sharrow Head roundabout. 1821 & 1878 Wesleyan Chapel, Stannington. 1828 Methodist New Connexion Chapel, Scotland Street. 1828 or 1829 (The date is not entirely legible). Parson Cross School, Halifax Road, at the junction of Southey Green Road. 1831 Holly Mount, Sandygate Road. 1833 Industry Place - Top of Hollis Croft. 1836 Pitsmoor Church Day School. Pitsmoor Road. 1836 Sheffield and Hallamshire Bank, Church Street. 1838 Woodhouse Parish Vestry, Tannery Street, Woodhouse. 1849 Foundation stone of Christ Church, Pitsmoor, reads 16th Day of July. 1850 Grenoside Primitive Methodist Chapel. 1851 Grimesthorpe Wesleyan Sunday School ? 1852 The lodge house on Taptonville Road. 1853 Samuel Osbornes/S.A.D.A.C.C.A, 48 Wicker. 1853 Westbourne Manor, Westbourne Road. 1854 The Old Sheffield County Court building on Bank Street. 1855 Grayson Willis & Bennett Solicitors, 7 North Church Street. 1857 Beech Hill (Out Building in the grounds of) Norfolk Park road. 1858 Heeley Primitive Methodist Chapel, 21 Gleadless Road. 1858 Wesleyan Chapel, Hollinsend Road. 1860 Royal Sheffield Institute for the Blind, Mappin Street. & 1939. 1861 The Royal Victoria Hotel. 1861 Wesleyan Reform Sunday School, Borough Road, S6. 1867 Nether Edge Bowling Club, 8 Nether Edge Road, S7. 1867 Sheffield Water Works Building (Now Lloyds No 1 bar). 1868 Hyde Place on Park Crescent. 1868 John Lewis, Cambridge St.
1870 Former Technical School, corner of Orchard Ln/Leopold Street. 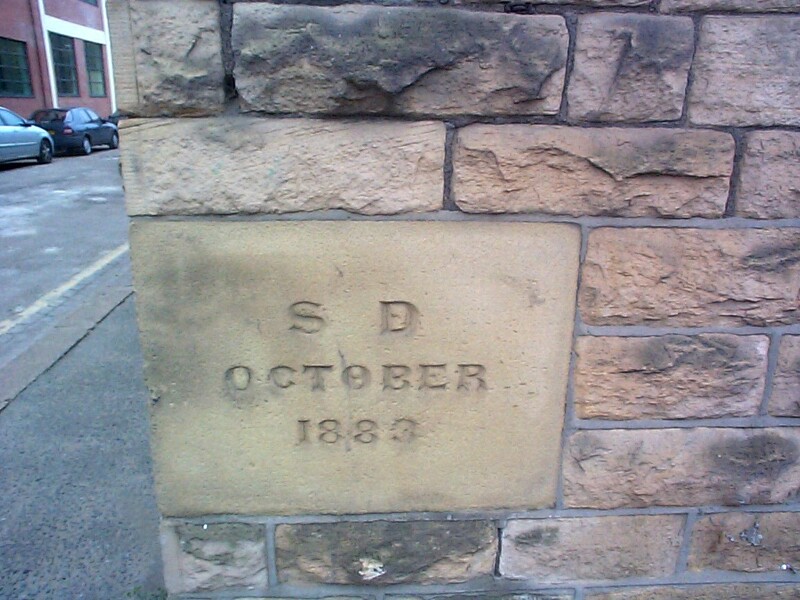 1871 St Mary's School - South Road Walkley. 1872 Broomhill Infant School, Beech Hill Road. 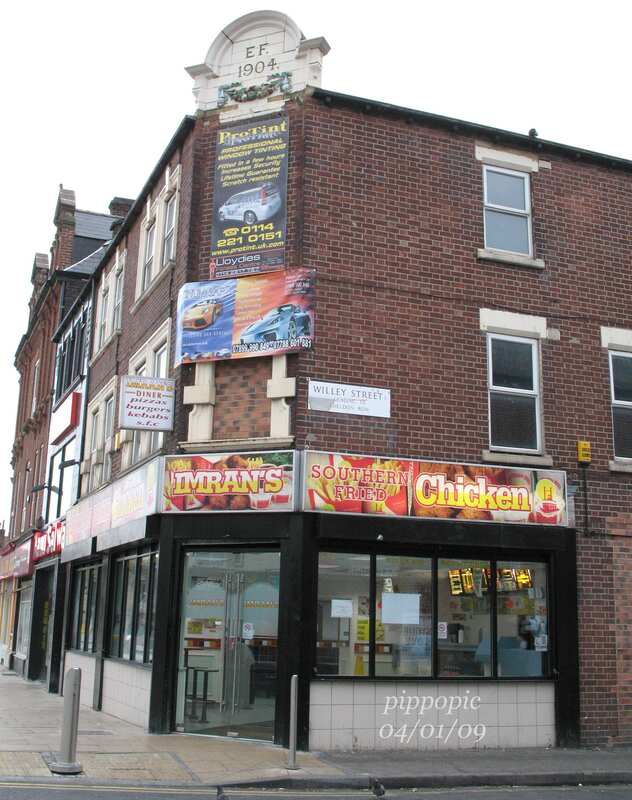 1873 Melbourne Place, 404 - 406 London Road, S8. 1874 Lowfield Primary School, London Rd, S2. 1874 Sheffield Gaslight Co. Commercial Street. 1875 Building on Sylvester Street. 1875 Pye Bank School, Andover Street. 1875 Springfield School, Broomspring Lane. 1876 Corner shop (Cherry Street), 397 Shoreham Street. 1876 Manor Lane Junior School. 1876 Ruskin building, Norfolk Street. 1878 Blind Institution, Manchester Road, Broomhill. 1878 Fir Vale Workhouse formely Sheffield Union Workhouse, became Firvale Infirmary then Northern General. 1878 Provincial House, Solly Street. 1878 Rose Villa, 84 Queens Road, Beighton. 1878 Woodhouse Wesleyan Chapel, Chapel Street, Woodhouse. 1879 Earl of Arundel and Surrey, Queens Road. 1879 Moor Oaks View, corner of Crookesmoor Road and Highnam Crescent Road. 1879 Office" Shoe Shop, Fargate. 1879 Sacred Heart Presbytery, Forbes Rd/Langsett Road. 1880 H&M Fargate (not entirely legible) ..? 1880 Providence Terrace (JPI), 124 Cross Hill, Ecclesfield. 1880 Terrace houses, Owler Lane, Page Hall - Grimesthorpe, S4. 1880 Sunday School adjoining St Johns Methodist Church at Crookesmoor. 1881 Crookesmoor House - at the junction of Crookesmoor Road and Crookes Valley Road. 1881 Channing Hall & The Upper Chapel Congregational Hall, Surrey Street. 1881 Perseverence Terrace, 26 Loxley New Road. 1882 Shakespeare Villa, Chesterfield Road. 1883 Aberdeen Works Trafalgar Street, S1 3RL. 1883 Waggon & Horses PH, Gleadless Road, Heeley. 1884 Building opposite Specsavers, Pinstone Street. 1884 HSBC Bank building, Pinstone Street. 1885 Hutton & Sons, Orange Street. 1886 Primitive Methodist Chapel, corner of Mansfield Road and Foxwood Road. 1886 Town Hall, also has extensions dating - 1887, 1888, 1894 (date on fall-pipe), 1895, 1896 and 1921 (date on fall-pipe). 1887 Endcliffe Park, Commemoration Stone (Queen Victoria). 1887 Terraced houses, (named Jubilee Place), 60 & 62 Taplin Road, S6. 1888 Bank of Scotland, Leopold Street. 1889 Albert Terrace, Middlewood Road. 1889 Barber Harrison and Platt at 2 Rutland Park. The number 89 is above the Rutland Park entrance to the building which is on the even number corner of both Rutland Park and Clarkehouse Road, so the number probably represents a date. 1889 Old Works, at 118 Mowbray Street. 1889 Victoria Terrace, Middlewood Road. 1889 Woodhouse United Methodist Free Church, Chapel Street, Woodhouse. 1890 Anns Road school, Heeley. 1890 Bodmin Street Reform Chapel. 1890 Cowlishaw Rise, Cowlishaw Road. 1890 Ebenezer Primitive Methodists - South Rd walkley. 1890 Prospect Terrace, Middlewood Road. 1890 26 Upper Albert Road, S8. 1891 Memorial Drinking Fountain, Meersbrook Park, S8. 1891 Number 37 Beechwood road, Hillsborough. 1892 Ferncroft, Cowlishaw Road, opposite the junction of Osberton Place. 1892 House on Ball Rd, Hillsborough. 1892 Pinstone Street, entrances/connections to the Salvation Army Citadel. 1892 Victoria Terrace, Staniforth Road. (probably 382, near the junction of Faranden Road). 1893 Laural House, 294 Staniforth Road. 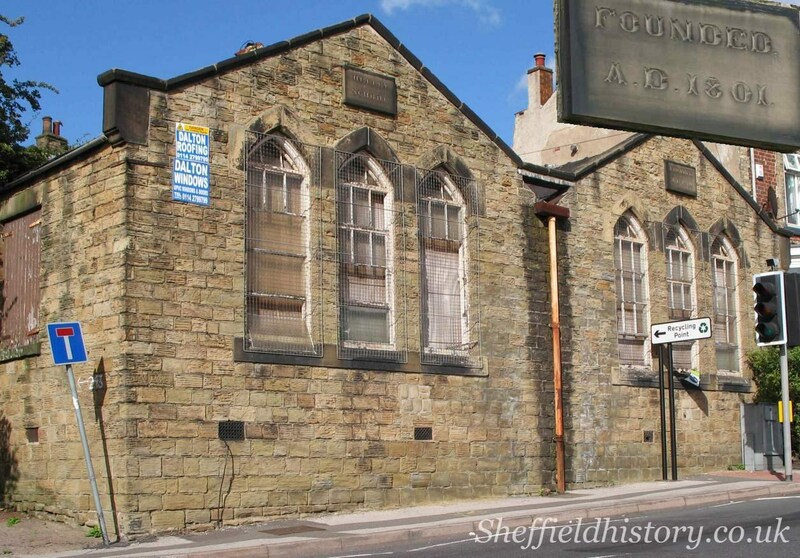 1893 St Johns Meeting Rooms, Abbeydale Road South. 1894 Northern General Hospital, Clock tower, also on old structure. 1894 Science school entrance, Orchard Lane. 1894 Special Steel Company Ltd, Faraday Rd. 1894 The Halifax Building Society, Surrey Street. 1895 Cairns Chambers, 20 Church Street. 1895 Myrtles, house on Parkside Road. 1896 Hillsborough Market, Holme Lane. 1897 Anns Grove School ( old) Heeley, formerly named Anns Road School. 1897 Crookes Market Place, Corner of Crookes and School Road. 1897 Centenary House, Heritage Park, (former Royal Infirmary) Albert Terrace Road. 1897 House on Hallamgate Road. 1898 Parkwood View - Shop on the corner of Walkley Lane and Kirkstone Road. 1897 Roslin Villas, 366-368 Firth Park Road. 1899 ????? Cottages, 222 Penistone Road North (The date is not entirely legible). 1899 Cyril Villa (Sheffield Music) on Ecclesall Road, near the junction of Hickmott Road. 1899 Jersey Villa, 1 Claywood Road, off Shrewsbury Road, S2. 1899 Stickford Cottages, Penistone Road North, near Vere Road. 1899 Woofindin Almshouses, Hunters Bar, Ecclesall Rd. 1900 Aby Cottages, 33 Vere Road. 1900 Attercliffe Bank, 570 Attercliffe Road. 1900 Carlton Cottages, 9 Vere Road. 1900 Castle House, Royal Exchange Buildings, Lady's Bridge. 1900 Claxby Cottages, odd numbered side of Vere Road. 1900 Haugh Cottages, 25 Vere Road. 1900 Hutton Buildings, West Street. 1900 Legbourne Cottages 57 Vere Road. 1900 Rigsby Cottages, 63 Vere Road. 1900 Royal Victoria Buildings, Lady's Bridge. 1900 Sheffield Savings Bank ((former) Heeley branch, Queens Rd. 1900 Somersby Cottages, odd numbered side of Vere Road. 1900 Swaby Cottages, 3 Vere Road. 1900 Tetford Cottages, odd numbered side of Vere Road. 1900 Thorseby Cottages, 49 Vere Road. 1901 Alford Cottages, 52 Vere Road. 1901 Boston Cottages, 20 Vere Road. 1901 Botanical Villas, Walton Road. 1901 Caistor Cottages, even numbered side of Vere Road. 1901 Don Valley Hotel, Attercliffe Road. 1901 Jeffcock's Nurse's Home, Ecclesfield. 1901 Louth Cottages, 60 Vere Road. 1901 Spilsby Cottages, 70 Vere Road. 1901 Sturton Rise - Osagathorpe. 1901 Rasen Cottages, 36 Vere Road. 1901 28 Vere Road, (Date and house name painted over and not legible). 1902 Coperfield Villas, Penistone Road North, between Fielding Road and Bickerton Road. 1902 Gainsbro Cottages, 10 and 12 Vere Road. 1902 Horncastle Cottages, 4 and 6 Vere Road. 1902 Moorland Villas, City Road. 1902 Wickfield Villas, Penistone Road North, between Fielding Road and Bickerton Road. 1903 Hallamshire Hotel, West Street. 1903 building on Lumley Street (east section), near the former Sheffield Central Works Depot, date is not entirely legible. 1903 St Silas Church Hall. 1903 8 & 10 Stanley Street, S3, former Thomas Wragg & Sons, firebrick manufacturers. 1903 The Cannon PH, Castle St.
1903 West End Hotel (new frontage). 1904 Cottage on Ringinglow Rd, (just above Castle Dyke, and next to playing fields drive). 1904 Darnall Market/HSBC Staniforth Rd. 1904 Walkley Library - South Rd and Walkley Rd. 1904 White House Buildings, Infirmary Road. 1905 Building corner of Glossop Rd/Regent Street. 1906 Balfour Villas, 502 Staniforth Road. 1906 Rutland Hall, off Rutland Road. 1907 Building on Glossop Road. 1907 Cavendish Buildings,West Street, with extensions dated; 1910 and 1919. 1907 Primative Methodist Centenary Hall & Sunday Schools, 117 Hawksley Avenue, S6. 1907 Somme Barracks Glossop Road. 1908 Building in St Peter's Close. 1908 Victoria Hall, Norfolk Street, (also on fall-pipe). 1909 HSBC bank, corner of Chesterfield Road and Chantrey Road, Woodseats. 1909 Shop, (former Post Office) 143 Ecclesall Road South, S11. 1909 Salvation Army Infirmary Road. 1909 The old telephone exchange on Pond Street. 1910 Building on corner of Wadsley Lane and Middlewood Road. 1910 Bus/Tram Sheds (former) Leadmill Road. 1910 Rivelin Tunnel, Wyming Brook Drive, Rivelin (bottom dam). 1911 Mappin Building, Mappin Street. 1911 United Methodist Church, Sicey Avenue. 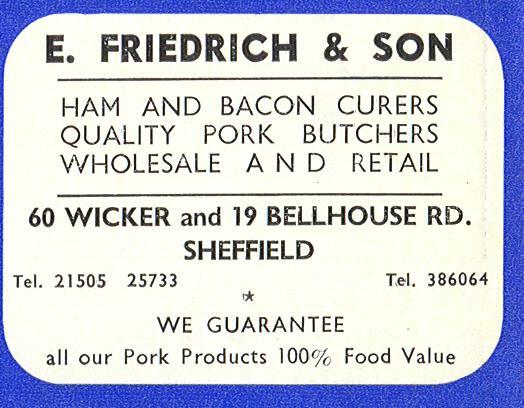 1911 Special Forged Products, Birch Rd. 1912 Houses 130/132 Dovercourt Road. 1913 Building on Hatton Road ? 1913 Tapton Hill Congregational Church, Manchester Road. 1913 Former SECS building (Amusement Caterers) on Walkley Lane at the junction of Carnaby Road. 1914 51 Bridge Street, junction of Love Street, S3. 1915 Co-Op Building, Nether Green. 1915 Park House, Bernard Street. 1915 The old S&E Co-Op building at the junction of Oakbrook and Hangingwater Rd. 1915 Mudfords Building, Exchange Street. 1915 Part of the North British Steelworks, Dixon Street, S3. 1922 Co-Op (S&E) Walkley Road. 1923 Mazda Buildings, behind the Cathedral on Campo Ln. 1924 Cadbury - Trebor - Bassett factory on Dutton Road, S6. 1924 St Judes Parish Hall, Gibralter St (Opened 29th April by F L Tozer). 1925 War Memorial Hall, Brook Hill. 1925 Manor House, Cross Street, Woodhouse. 1926 Walkley and Hillsborough District Baths (now Rawson Spring Pub). 1927 The Wharncliffe public house, Bevercotes Road. 1930 Corner of Dixon Road and Wynyard Road, Hillsborough. 1930 Burtons building, now Subway at Hillsborough corner, laid by one of the Burton's. 1931 Childrens Hospital. (extension perhaps?). 1931 Salvation Army building, Darnall Road. 1932 St Aidan's Church, Manor Lane. 1933 Building now occupied by Sheffield Hallam University, Eyre Lane (also displays a 1945 date). 1934 J D Cook & Beard Homes, Argyle Close, Meersbrook. 1935 Beauchief Gardens, Abbeydale Road South. 1935 Row of shops at Gleadless Townend on Whites Lane / Norton Avenue. 1936 St. Gabriel's Church, Greystones. 1937 Building? on Cross Street, Woodhouse. 1939 Building on Trippet Lane (next to scout shop). 1939 Centre 45,(the former bail hostel, and Probation services building) 45 Division Street. 1939 Fairleigh Social Club, Fairleigh, Manor Top. 1939 Royal Society for the blind, Mappin Street. 1945 Building now occupied by Sheffield Hallam University, Eyre Lane (also displays a 1933 date). 1950 Eye Witness Works, Thomas Street. (date of - part rebuild). 1952 - CBC Computer Systems, Redwood House, 68 Brown Street, S1. 1953 Balfour Darwin's Beeley Wood forge, Beeley woods. 1954 Steps at Hangingwater Road bridge, leading down to Shepherd Wheel dam (Renovation date). 1955 Scout Shop, Trippet Lane. 1964 Friends Meeting House, Hartshead Square. 1981 Oaksfold cruck barn,Concorde Park. 1988 Duchess Road Community Centre, S2. 1988 Flats/Houses, corner of Monmouth Street/Hanover Street (former). 1989 Yates' Wine Lodge, Carver Street. 1989 Quaker Meeting House, St James Row. 1993 Building on the corner of Carver St/Division Street. 1991 Tudor Square (date opened). 1992 Sheffield University, Regent Court, Portobello. 1995 Ozzy Owl date stone, (house) Walkley Road. 1998 Upperthorpe Medical Centre, Upperthorpe. 2000 Egerton House, Egerton Street. 2001 Building in Hartshead Square. 2000 Extension to a building on Tom Lane. 2003 Montgomery place, Montgomery Terrace Road. 2005 JLM Court, Longfield Road, S6. 2006 The building now on the site of the Ecclesall non political club. 2008 Green Homes, Guildford Walk, Norfolk Park. 2008 Middlewood Hospital (Former), Administration Building (date on New clock). 2008 Vincent Court, Manor Lane, by the junction of Maltravers Road. Not sure if this counts... The initials W.B. and the date 1627 are carved into the oak panelling in the Hall of Bishops' House. on the exterior of buildings. What about the photograph purple jumper took for the Methodist church thread? Also I have a photograph of the childrens hospital which looks like 1908. I will check what it is the next time I pass. photograph courtesy of member purplejumper.